The leaves and seeds of this deciduous shrub are used to flavor soups. The bark is emetic in large doses. The berries are used to produce a wax used in the making of candles. Though brittle, the wax is aromatic. The root bark is used to inprove circulation and to treat infections, diarrhea, irritable bowel, fevers, colds, and externally for dandruff, sores and itchy skin. 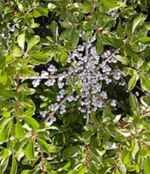 The plant is a large shrub, growing to 9ft. and is extremely hardy (to -50F). Valuable for wildlife food and as a nitogen fixer and grows in full sun or partial shade, preferring a moist, well drained peaty soil.